Chris Morgan had never rowed before when he sat down on a rowing machine that formed part of the Adelaide University Boat Club's display during O Week in February 2003. The 22-year-old Commerce graduate and Computer Science student was interested solely in the prize on offer for the fastest time over the machine's simulated 500m course: a carton of beer. Chris not only got the beer, but in the process launched an international rowing career which in just two years has seen him make the national senior men's team and win gold at the World University Games. "I remember thinking that the machine was the hardest thing I had ever done - it didn't last for very long but I was stuffed at the end of it," he said. "They looked at the time and asked me if I'd like to come out and row for the club, and it's gone on from there." Growing up, Chris had shown promise as a walker but decided not to pursue it as a long-term sporting option. He completed the first two years of his degrees in 2001 and 2002 without competing in any sport, and had been keeping fit by going to the gym. "My nickname around the club is 'Walker'," he said. "When I came out for my first race, the person filling out the sheet put my name down as Chris Walker because they'd only ever heard me be called Walker and just assumed it was my last name! "One of the things I like about rowing compared to walking is that there's a real social element to rowing. "Walking can be a very solitary sport because you spend most of your time training and racing on your own, but with rowing, you meet lots of new people and I've made lots of friends already." 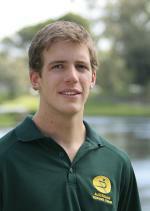 Earlier this year, Chris - along with fellow University of Adelaide student Trent Collins - was a member of the Australian quad sculls team which finished 11th at the World Championships in Japan. In 2004 he won gold in the men's double sculls at the World University Games in France. Chris has already completed his Commerce degree and begins his final Computer Science exams this month, and as an elite athlete studying at Adelaide, has had access to the University's new Elite Athletes Support and Information Service. He has long-term plans to become an IT manager, but for the short-term his focus will be rowing. "I want to reach my full potential as a rower so that's what I'll be concentrating on after uni - but I've got the degrees there because I know I won't be able to row for ever, and that they'll help me with my career," he said.